Homeschool Stories: Our Geography "Museum"
The main shelf - eye level to most of the kids - has more books and a children's Encyclopedia set discarded from our local library (with a really cool set of elephant book ends) and a set of tiny tile drawers (made in India). There are nine drawers and we keep set of coins from different continents, Saint medals, rocks and other goodies in various drawers. These are very popular with the little ones. They are allowed to take out one drawer at a time and can't take it to the basement or upstairs. It's easy to spot when one gets left out since a whole drawer is missing. We also have a miniature trunk (with an old-fashioned map motif) with more post card sets, special books of interest displayed on the plate racks and a top shelf with breakable goodies from different parts of the world (mostly gifts from family members who went on trips - an Irish crystal mug, a tea set from Taiwan, etc.) 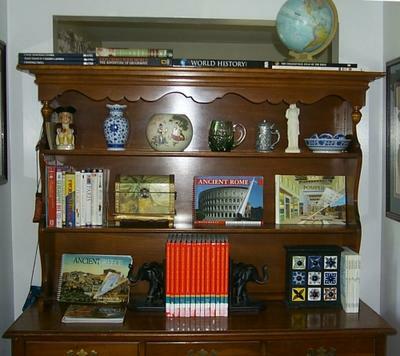 The top of the hutch is a great place for coffee table books that we look at only on occasion. I found a lot of the key pieces to our museum (the elephant book ends, the miniature trunk and the little tile drawers) in Target's "Market Bazaar" section (in fact, the clearance part of it). They really helped the whole thing come together. My dream is to set up a Science "Museum" some day too. I think it helps to have cabinets on the lower part so the toddlers aren't pulling things out constantly and not to over-clutter (I store some things in rubbermaid tubs in the basement and rotate). My three year old can reach the little drawers, but my 18 month old can't. Not necessarily ideal for Montessori - but more ideal for our house. :) There are always big siblings around to help anyway.